Each of the five fragrances represents an aspect of AERIN. The five scents include: Gardenia Rattan, Amber Musk, Lilac Path, Ikat Jasmine, and Evening Rose. 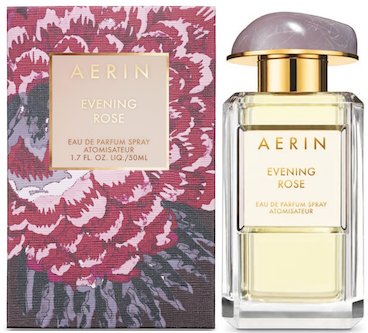 I adore the aesthetic of the AERIN line. There is meticulous attention to detail, whether in the blending of the fragrance or the consideration of each element in the packaging. The packaging draws inspiration from Aerin’s everyday life and is inspired by natural elements such as stones and flowers. The bottles are substantial and weighty; each is adorned with a beautiful gem-like stone in a soft pastel shade specific to each fragrance. 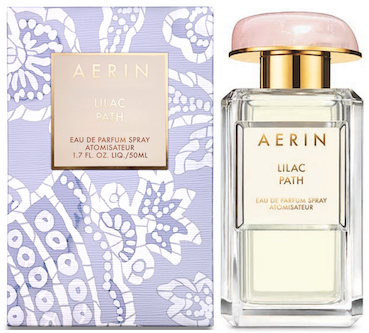 The cartons feature an exclusive AERIN for Lee Jofa fabric design, reflecting each fragrance’s individual story. Gardenia Rattan was inspired by the spirit of summer. 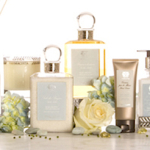 I wasn’t surprised to see a Gardenia fragrance in this collection. When Aerin crafted the Private Collection Tuberose Gardenia fragrance (for Estée Lauder), she was inspired by the first flower she fell in love with. Gardenia Rattan has Wet Marine notes, a white floral heart that includes Gardenia, Tuberose, Tiare Tahiti and a drydown lush with Amber. The carton is reminiscent of a summer garden in the Hamptons and features the “Sayre” print; a pretty, modern take on a traditional floral pattern. 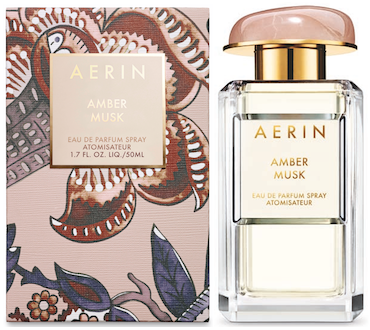 Amber Musk blends sensual florals, distinctive amber and creamy musk. 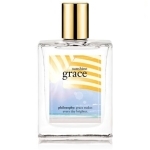 This scent aims to evoke the feeling of wrapping yourself in a warm blanket on a cold winter day. I haven’t personally tried the Amber Musk fragrance, but since I’m partial to fragrances that have a musk-based drydown, I’m sure I would love it. The carton features the “Kenlyn” design; a personal take on the floral prints that were always part of Aerin’s grandmother Estée’s home décor. Lilac Path is my pick of the scents I tried. Lilacs are my favorite spring flower and the Lilac Path fragrance was inspired by a lilac bush that blooms every spring at Aerin’s country home. In addition to the prominent lilac notes, the fragrance is balanced by a crisp green note, creamy Jasmine lactones, Angelica Seed Oil and Orange Flower. The carton is a re-imagined take on the line’s signature batik packaging. There’s something so old-fashioned about lilacs; this fragrance captures that nuance. Ikat Jasmine is an ode to the modern woman; the essence of casual chic. This fragrance can be worn year around and includes notes of Jasmine Sambac and Jasmine Egypt Infusion, enhanced with exotic Tuberose Fleur, Honeysuckle, Tuberose Infusion and Sandalwood. 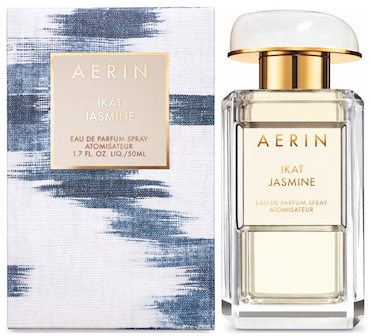 Ikat Jasmine is a beautiful fragrance and each time I wear it, I get complements. There’s something about the fragrance that has a very “clean” note. The packaging was inspired by the blue and white floral wallpaper in the room Aerin grew up in. Evening Rose feels the most complex and sophisticated of the fragrances I tried. The inspiration is a woman who is strong and assertive, yet feminine. Evening Rose notes includes Juicy Blackberry, rich Cognac, voluptuous Rose Centifolia and Bulgarian Rose Absolute and incense. The result is a confident, sultry fragrance. The “Hither” pattern on the Evening Rose carton was adapted from an English Jacobean hand-blocked linen, dating back to the early twentieth century. 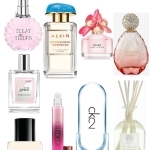 You can find the AERIN Fragrance Collection (1.7 oz. 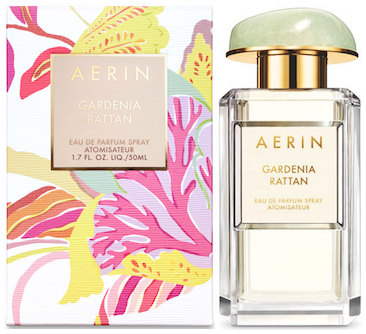 bottle, $110 each) in at select retailers and online at AERIN.com and EstéeLauder.com. Each of these fragrances exudes quality and attention to detail. I hope there are more to come!